Noodle Party? Let's expand the definition of the noodle first. It can be any shape- long,short,thin,or wide, such as all kinds of pasta: spaghetti, rotini,macaroni,or lasagna,etc. It can be made from any material- wheat,rice powder, beanstarch,or potato powder,etc.Open your mind and bring whatever you regard it as noodle, and then open our mind. Top three dishes will be selected to reward a bottle of red wine. How to get there: Take metro line 6 and get to the terminal station(GangChengLu station), then call a taxi and 10 minutes you'll get there. Cost: Free if you bring your "noodle". RMB100 if you just want to hang out and tasting. Registeration: Please fill in below form for registeration. According to this, our three upcoming events are about Jiaozi, Noodle, and Pancake. The above foods are Chinese staple food, especially in Northern China. Most of them are made of wheat flour. Wheat flour nourishes the heart while the heart is active in summer. Meanwhile wheat flour has more Yang Qi and energy than that of rice. People lost appetite and feel tired in summer. It's a good season to lose weight,but we are working people and need energy to survive this competive environment. Sanfu tian in this year begins on July 18 and ends on August 7. Do you begin to feel sluggish now? 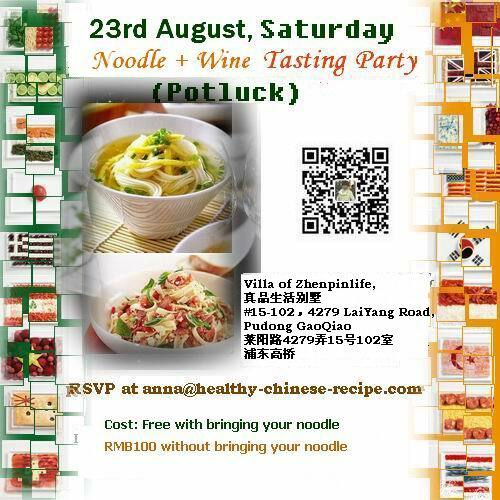 Come and join us to refill energy with Jiaozi, Noodle and Pancake!